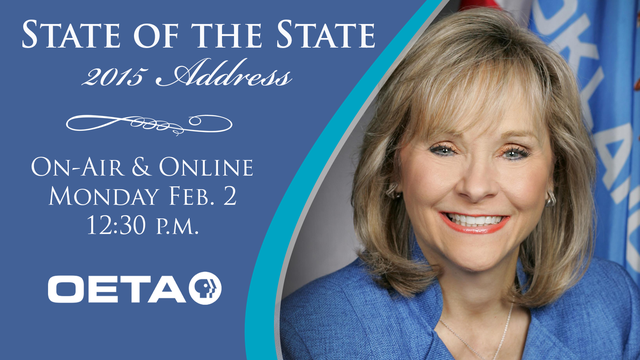 Monday February 2 at 12:30 p.m., OETA will provide live statewide coverage of the 2015 State of the State address of Governor Mary Fallin. As Governor Fallin outlines her 2015 legislative and policy agenda during a joint session of the Oklahoma Legislature, OETA will provide the state with the full speech, plus analysis and reporting. OETA will also provide a live stream of the address online at www.oeta.tv. The State of the State Address will archived and available to watch online. As the broadcast partner for the event, OETA will also provide all broadcast television media in the state with video of the speech. The live broadcast from the chambers of the Oklahoma House of Representatives will begin at 12:30 p.m. and end at approximately 1:30 p.m. Governor Fallin is expected to begin her address at about 12:45 p.m.
OETA consistently engages Oklahomans across the state with educational, national and local public television programming, community engagement initiatives and interactive online features that collectively encourage lifelong learning. Explore www.oeta.tv for more information about Oklahoma productions, to watch videos, access community resources, view show schedules and more.